We supply and maintain a range of fire fighting equipment all manufactured to British Standards BS EN3. Each time a customer orders a fire extinguisher as a replacement or as a new unit, a full service is carried out when delivered to site - Note that without this the unit or units will not comply with the British Standard BS 5306. For customers with fire extinguishers under a service contact with us replacing exiting units there no delivery charges or additional charges for this service. For customers without a service contract, please ask at the time of ordering whether any additional costs apply. The Water fire extinguisher is for fighting class A fires, such as with wood, paper and textiles. This is probably the most common Fire Extinguisher that is see and an economic solution to the most common fire risk. 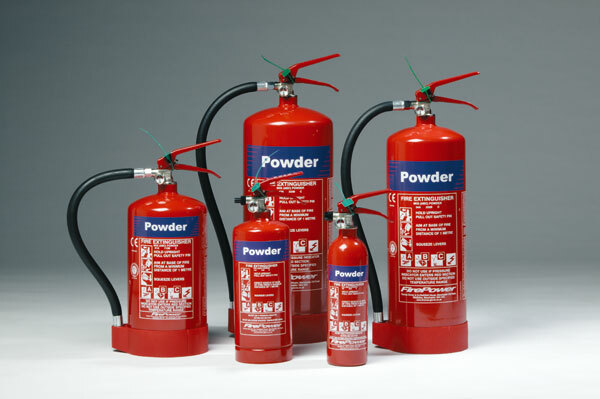 The Dry Powder fire extinguisher is for fighting class A, B and C class of fire. These can be used to deal with electrical hazards, flammable liquids and gases. 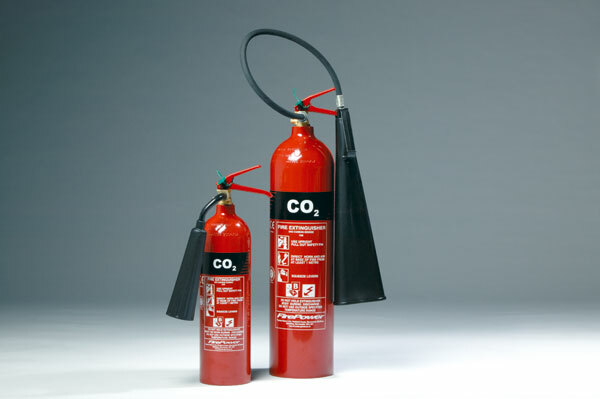 The CO2 fire extinguisher is for fighting class B fires as well as those involving electrical equipment. The non-conductive anti-static horns are suitable for fires involving flammable liquids and electrical hazards. Ideal for office environments with electronic equipment. 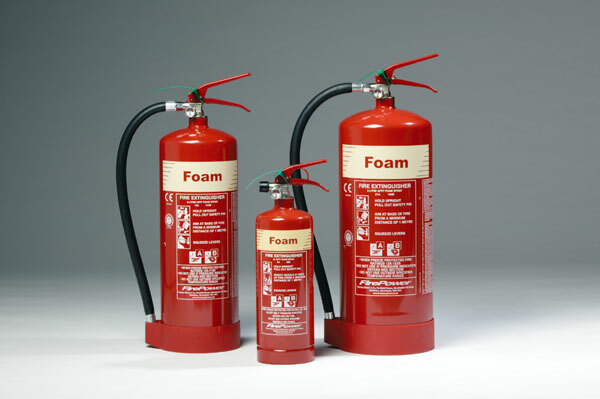 The Foam AFFF (aqueous film forming foam) fire extinguisher is for fighting class A and B fires, invovling flamable liquids such as petrol or paints. The foam provides a smothering seal over the surface preventing oxegen reaching the fire and so extinguishing it. Passed the electrical conductivity test of BS EN3, so it can be specified for fires in proximity of live electrical equipment, in accordance with BS 5306: part 3: 1985. The Wet Chemical fire extinguisher is for fighting class F fires which involve cooking oils or fats. The wet chemical works quickly knocking down the flames, cooling the burning oil and chemically reacting to produce a soap-like solution which then seals the surface to prevent any re-ignition.